It’s easy and in Jefferson County, it’s FREE. Please go to our Join 4-H! page. What Do You Do in 4-H? STEM (Science, Technology, Engineering, and Math) covers topics such as plant and animal sciences, engineering and technology, and environmental sciences. Citizenship includes communication and leadership skills, as well as business and citizenship topics. Creative Arts covers all things creative, such as photography and sewing. Healthy Living addresses how to be healthier in all aspects of life, from cooking to exercise. Take part in 4-H Club/Group Meetings – Club/Group Meetings will be a mix of business (things like planning your year and raising money for what you want to do), education (on topics like how to do a good presentation), and FUN! During Project Meetings (which may happen at the same time as Club/Group Meetings) members get to work on their chosen projects. Working alongside caring adults, all youth get to help make decisions at the meetings through taking on leadership roles, sharing ideas, and voting. 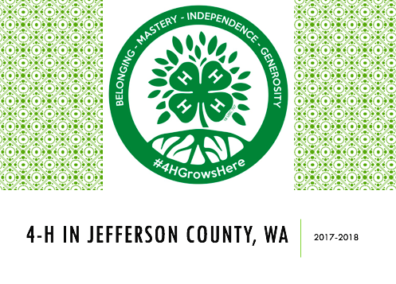 Take part in the Jefferson County 4-H Council by coming to a meeting or event, or helping with a fundraiser that benefits all 4-H youth in our county. Take part in a least one 4-H community service project – something that you can plan and work on with others in your Club/Group and/or with other 4-Her’s throughout our community. Give a public presentation at a Club/Group meeting, 4-H county event, and at county fair. This is a way to share with others the great things you’re learning. Keep good records of your year in 4-H. 4-H can supply members with a standard 4-H Record Book, or you can make one based on the do-reflect-apply, “experiential learning” model (that is, records that show what you’ve done, what your learned, and what you’ll do with your learnings). Take part in Jefferson County Fair. By doing this, your learning doesn’t stop with just you! You get to share it with our broader community …and earn awards and money when you do! What Does 4-H Look Like in Jefferson County?